Would you combine these 2 colors together for a monochromatic quilt? Not sure. Thread: Would you combine these 2 colors together for a monochromatic quilt? Not sure. 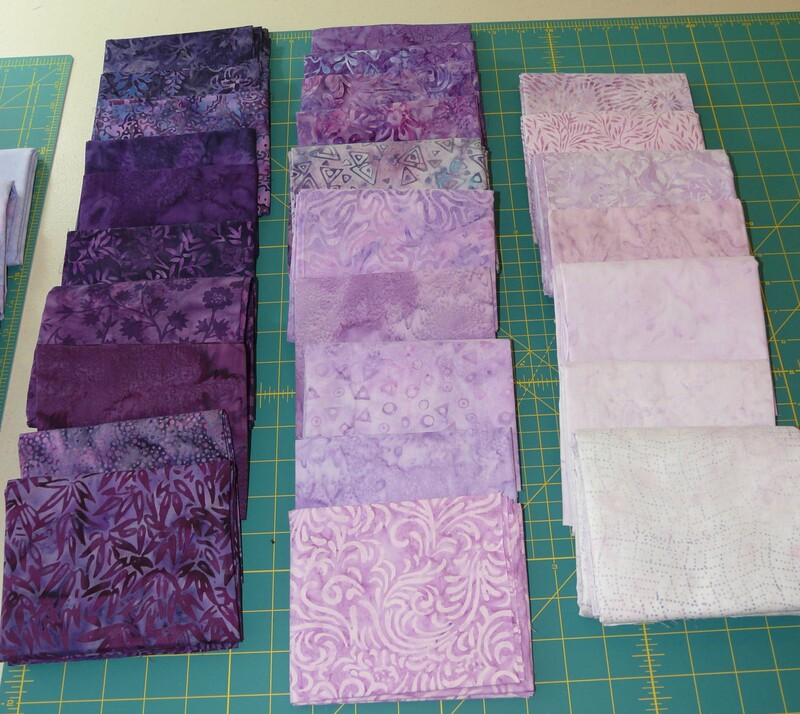 I am excited to be planning 2 purple monochromatic quilts. http://www.quiltingboard.com/main-f1...ml#post6123697 See post #4 for photo. Really incredible. http://www.google.com/imgres?q=blue+...81&tx=94&ty=70 This one is referred to as a Kaffe Economy Blue quilt. I have amassed a large collection of purple batiks but they fall into 2 different color families. I have a collection that is more a violet-blue and then another collection that is violet-plum (or red). Would you only use one color collection or consider these both as "purples" and mix them? 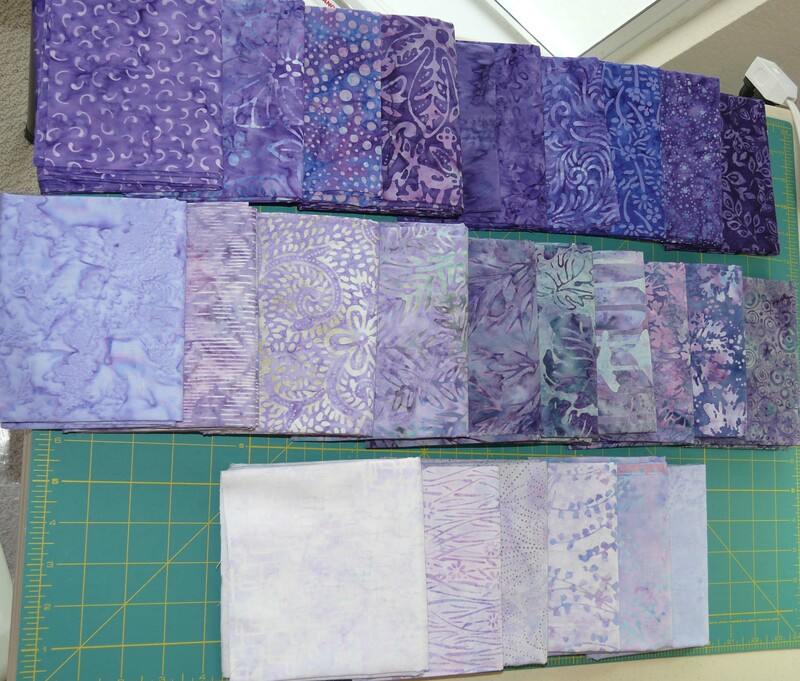 I am thinking that maybe because you want the look to be more uniform for the Ohio Star one to only use one collection (my favorite is the violet blue one) and then maybe using both mixed for the Economy quilt. I would like to hear other opinions as I find color selection to be very difficult. Here are my collections. The first photo is all fabrics, the second is the violet-blue one and the last is the violet-plum one. Thanks. Yum, purple is my favorite, love both collections and I think you have a good plan to use them. Oh my I must stop drooling on my keyboard your collection of purple batiks is soooooooo beautiful !!! I am hand piecing a drunkards path using a combination of both of those colourways in batiks at present and they mix very well together in the quilt top. I would combine them for both quilts. Makes the quilts more interesting for me. Blues and reds especially, it seems to me, easily become boring when the fabrics are too alike. I think they'd look great. Those are my favorite colors in gatiks. Why not put together. Purple matches purple and we frequently put blue with red. They are beautiful colours please hurry and put together and show finished top. I say the more the merrier. I am a nut for blue and one of my favorite quilts I ever made is a "monochromatic" that stretches the blue at both ends of the spectrum, including some that are nearly green turqoisy blues, and some that are almost purple. It gives a richer texture to a "one-color" quilt, imho. I think your quilt will have much more 'movement' if you mix all the colours - more 'life' to it (if you know what I mean, lol). Combine them it will be wonderful. Go for it; combining these will look spectacular! I am another to say using them all! Those are very pretty! My friends and I saw a monochromatic purple quilt in a show once. It was a simple rail fence, but the most beautiful quilt there! We studied it to figure out WHY such a simply patterned quilt was the most beautiful quilt there, and decided it was because the maker used every shade of purple imaginable: bluish purples, pinkish purples, reddish purples, greyed purples, purples which were almost black, purples which were almost white, etc. All that variety in a monochromatic quilt made it so exciting! 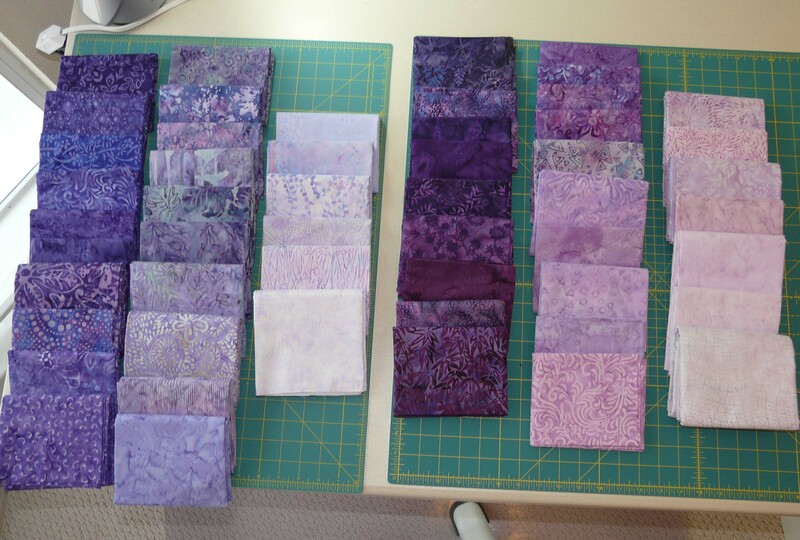 So when it came time for me to make a purple quilt as a gift, you can guess just what I did! Use them all, and more if you can get your hands on any others. You won't regret it. Have fun! I not into purple but these are GORGEOUS!! Whenever I see purple, I think of my DIL. She love purple... Have you all seen the commercial about paint. P-u-r-p-l-e. guys painted in purple. If you plan on making the Ohio star quilt I think you might have too many fabrics in the medium value range. Convert your photo to B&W and look at it again. With the OS quilt the value is the key, and the example has pretty well defined lights and darks. If you want yours to be just as defined, you need more lights and darks and less of some of the colors in the middle range. If you were looking to make a bargello though ... the selection is perfect!! As for the blue quilt ... I don't think values are going to make as much of a difference. So whichever one you were planning on using for the blue quilt the fabric collection is fine. Actually ... I looked again and the selection that is more on the red color range has a more distinct value range than the purple with the exception of the 4 colors at the top of the photo in the middle row. Another vote for using them all. Variety is the spice of life. Delicious fabrics you've picked! Should be an awesome, rock your world, quilt! Please keep us posted on the progress. I see four photos - but they seem to be two sets that are duplicates of each other. They are beautiful, I think I would mix them. Good eyes! I didn't catch that, but you're right. I think there are two photos of fabrics, and then she posted closeups for us. Here are my collections. The first photo is all fabrics, the second is the violet-blue one and the last is the violet-plum one. I wanted to show them all together so you can see how they vary from each other but also a close up of each separate grouping so you can see clearer. Love your selections and I would, imho, certainly combine both groups for this pattern. It is gong to be awesome. It is a big quilt and can handle all this wonderful fabric. Please post as you go! I am going to subscribe to this thread So I can watch you build your star! EDIT: @ post #17, I totally agree with this assesment of the colors. After looking again there needs to be more lights and darks to maintain the clarity of the design. When I made the red one, there was no planning on the colors, just the tone so even though the quilt reads as a red quilt the colors wonder into the purples and maroons and rusts without repeating any fabric. Last edited by ube quilting; 07-11-2013 at 02:26 PM.